There are nearly 4,000 species of native bees in the United States alone! With the exception of bumblebees, nearly every native bee species in North America are solitary. They come in a variety of shapes in sizes, from enormous carpenter bees to the tiny Perdita genus. If you want to learn more about bumblebees, check out our blog about how you can make your garden bumblebee friendly! Unlike European honeybees or bumblebees, solitary bees are stingless, do not have a queen, live in a colony, or make honey and wax. Instead, female solitary bees build tunnels to use as nests, where they lay their eggs in a series of chambers packed with a pollen and nectar “paste” for their young to munch on when they hatch. Since males will hatch and emerge from the nest first, the mamma bee will lay the females in the deepest portion of the nest and males in the front. Around 70% of solitary bees are known as “mining bees” because they tunnel underground to build their nests. The other 30% of bees are cavity-nesting bees and will nest in anything from hollow or pithy stems to dead wood, or even abandoned snail shells! Native bees are incredibly important pollinators. Unlike honeybees, which carry pollen in a “pollen pouch” on their legs, native bees are a bit less tidy, covering their whole bodies in pollen to carry it home. This messiness means they lose much more pollen as they go flower to flower and it actually makes them much more efficient pollinators. Some plants actually need native bees to be pollinated at all! Squash and gourds and any other members of the Cucurbita genus all rely on very specialized Squash Bees! For more on the Squash Bees, check out our Blog on the topic! These bees are pretty neat! Here are some tips for Making your garden a native bee paradise! One of the most important things you can do to help protect your local native bees is to make sure that your yard is full of potential nesting sites. For mining bees, leave sunny patches of bare earth for nest sites and try to avoid laying down anything that could be a barrier (like landscaping cloth, gravel, or mulch) for bees accessing or emerging from potential existing nest sites. 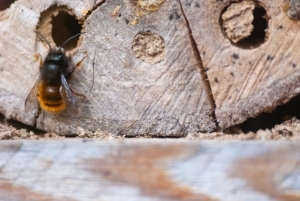 Also, leave unused areas of your garden with old wood, stones, or branches undisturbed as a cavity-nesting bee haven. You can also install a bee hotel in your yard. Often made from wood or bamboo, these hotels are great for cavity-nesting bees like the Blue Orchard Mason Bee or Leafcutter Bee! You can build one yourself or buy them from reputable suppliers like our friends at The Bees Waggle. To ensure that your garden is a Mecca for bees of all shapes and sizes, you need to make sure that there is a diversity of forage as well. Plant a mix of perennials and annuals so that you will have a mix of different blooms at the same time throughout the entire growing season. Also, try to have blocks of color in your garden so bees can easily find their way to the flowers they like over and over again, without having to hunt all around for them. Of course, native bees like native plants, so make sure to dedicate a portion (or all) of your garden to wildflowers. The Xerces Society has a variety of region-specific plant guides for pollinators that can get you started toward planting for native bees. We did the hard work for you and made our Bee Rescue Wildflower Mix that will provide great season-long forage for both native and honeybees! Pesticides can’t discriminate between the bad and good bugs. These insecticides pose a particular danger to mining bees since they are often applied to bare ground areas around structures that are ideal nesting sites for these bees. These insecticides also pose the risk of washing into other areas of the garden and contaminating nest sites. Neonicotinoids, or neonics, are systematic pesticides that live inside the plants that they are trying to protect. These have been particularly harmful to our various pollinator species because they work their way up through the plant into the nectar and pollen that various pollinators are attracted to. Flowers with neonics applied are actually luring bees and other insect pollinators to their deaths! For tips on how to protect your garden and the bees in it, check out our eBook on Organic Pest Control! One of the most important things your can do to protect native bees is to learn! Take some time to watch all the bees that visit and live in your garden. Visit the Xerces Society website and use their identification guides to try to figure out which bees you are seeing. Most importantly, SPREAD THE WORD! Educate your friends and family about all the bees that don’t make the nightly news and how vital they are to our future! The Dirt – our blog! The Pollinator Partnership – Nonprofit dedicated to promoting the health of pollinators through conservation, education, and research. Hooray for Hummingbirds! 3 Recipes for HOT Days!